The dry, red landscape of Australia’s Northern Territory represents Australia’s iconic Outback. Explore dusty desert plains and dramatic gorges, see unique Australian wildlife and learn about Australia’s Aboriginal people, one of earth’s oldest living cultures. In the Red Centre and the Top End, discover the awe-inspiring sight of Uluru, spot crocodiles, hear pioneering stories from Outback pubs and enjoy Australia’s tropical northern coast. Australia’s arid heart, the Northern Territory’s southern desert region, is known as the Red Centre. Set up base in Alice Springs, an oasis in the dusty, red plains. Learn about the 50,000 years of indigenous Arrernte culture and choose an exciting tour: camel rides, hot-air balloon trips, cycling or four-wheel driving. East of Alice Springs is the Simpson Desert, a stunning plain with long dunes and hardy spinifex grass. Visit in winter to explore Dalhousie Springs and Chambers Pillar Historical Reserve’s mysterious rock formation. Travel west to see Uluru, the spectacular singular rock formation in the Uluru-Kata Tjuta National Park. The iconic red monolith is breathtaking, especially when lit by dramatic red-and-violet lights of the rising or setting sun. 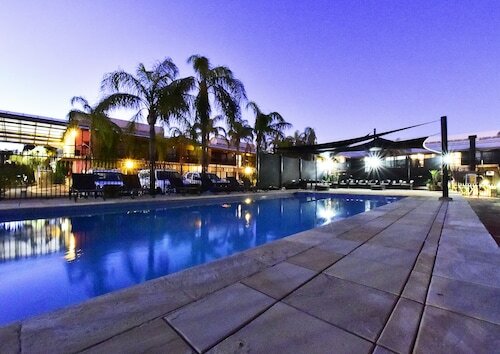 Stay overnight in the resort town of Yulara. Learn about Anangu’s cultural significance at the Uluru Cultural Centre. 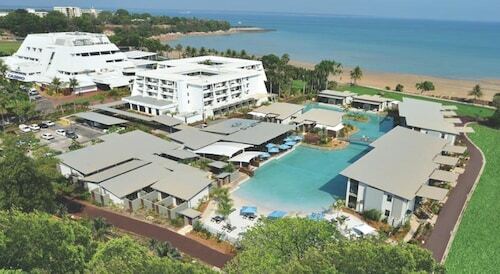 Head north to explore lush landscape in the Northern Territory’s contrasting Top End. 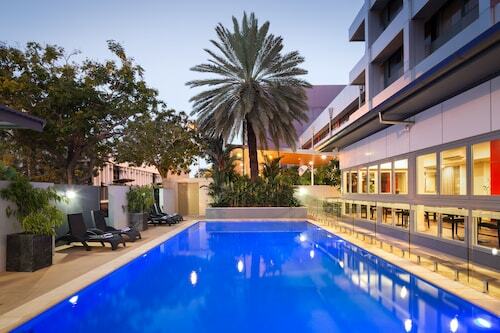 Visit Darwin, the multicultural capital city, to enjoy the relaxed, tropical lifestyle. In August, take part in the Darwin Festival, a diverse arts, music and food festival that celebrates the city’s indigenous, Asian and Pacific cultures. Travel east to Kakadu National Park, a region of incredible natural beauty with wetlands, savannah woodlands, dramatic coastline, diverse wildlife and Arnhem Land indigenous culture. Major airlines serve Alice Springs and Darwin. Regional flights and the historic Ghan Railway reach other smaller towns around the state. Driving is the best way to explore the state but ensure you take every safety precaution. Have water, fuel and emergency supplies for hot days, freezing nights and tropical storms in the north. Encounter the breathtaking beauty of Australia’s red heart. Desert waterholes teem with birdlife. Uluru glows at sunset. Great Sandy Desert dunes tower overhead. Picnic by colourful sandstone cliffs and explore the indigenous paintings in this reserve, then stay for the incredible sunsets. Enjoy the remoteness and natural beauty of this nature park that was once thought to contain valuable rubies. Hike through a landscape of gum trees, rugged gorges and saltbush plains and watch for wallabies and knob-tailed geckos in this national park. Picturesque cliffs and a waterhole surrounded by bush mark the entrance to the West MacDonnell Ranges. Enjoy views back over Alice Springs and across the ranges. Pan for gold, explore an old mine and wander through the historic streets of Central Australia’s first town, where gold fever was in full swing from 1887 to 1913. Camp by tranquil waterholes bordered by old gums with only kangaroos, galahs and waterbirds for neighbours. Discover thousands of ancient rock carvings by the Arrernte people of Central Australia in the sandstone caves and rock overhands of this sacred site. Walk through this towering red-sandstone gorge carved out by floods to discover a rich array of native flowering plants, ancient cycads and diverse bird species. Take a swim in this fresh water creek between glowing red cliffs and ghostly gums or picnic on the sandy bank and enjoy the serenity of the Australian outback. Walk through the red-stone cliffs of this gorge and watch the skies for the wedge-tailed eagle while you cool off in a waterhole. Jump into the sparkling turquoise waters of this idyllic natural pool, where spectacular rocks and a scenic waterfall form the perfect backdrop for a swim. 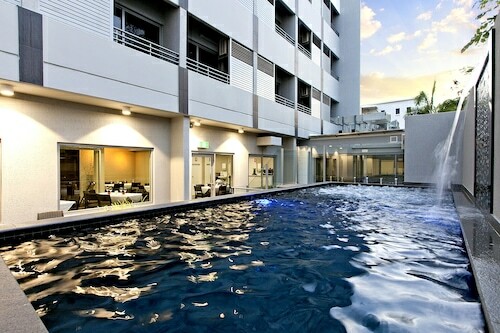 Situated near the airport, this romantic hotel is 0.8 mi (1.3 km) from Marrara Sports Complex and 2.7 mi (4.3 km) from Casuarina Beach. 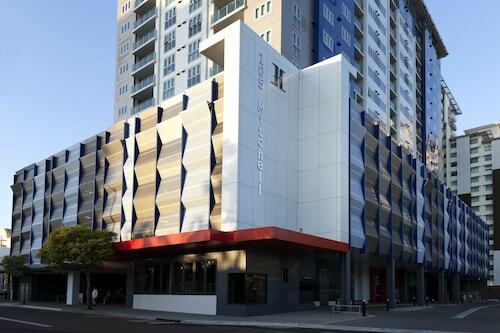 TIO Stadium and Casuarina Square are also within 3 mi (5 km). 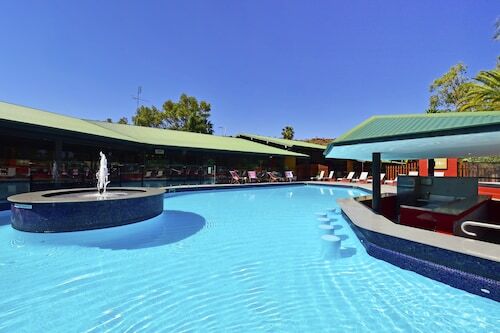 Situated in Alice Springs, this motel is steps from Australian Aboriginal Dreamtime Gallery, Todd Mall, and Adelaide House. Alice Springs Reptile Centre and National Pioneer Women's Hall of Fame are also within 10 minutes. Ciccone Alice Springs Station is 19 minutes by foot.